The single leg Romanian deadlift is one of my favorite exercises to program. My clients know to expect to see it in their programs. One of my clients was having some trouble performing it a few weeks ago. I broke it down for him and thought the explanation might be able to help some people out there. Everything following is part of the email I sent him which breaks down my thought process and gives specific cues to address his technique on this exercise. In terms of things that stand out to me, I would first bring up your shoulder level. This alone is not an issue. If you follow it up your back, you should have a flexible spine that can kind of “slinky” to compensate for this. The goal of standing on one leg is to keep the other leg off the ground. This is gait. If you cannot keep the free (the left leg in the picture) off the ground, then you will trip over yourself. Can your feel your right inside foot (longitudinal) arch in the ground? Can your right ab wall let go of your right pelvic bone (ilium)? Can your right gluteus medius and left ab wall turn on to oppose your right ab wall and intercostals? Can your left serratus anterior and trapezius stabilize your thorax on the left side? Or does your left levator scapula have to pull on your neck to get your center of gravity back over to the left? The more of these things you can do at the same time, the more “slinky” you are. When I see shoulders like your’s while on one leg, it tells me that your thorax doesn’t want to play with the rest of the body. I want these three balls to be able to move independently of one another. For example, when you stand on your right leg, I want your thorax to come back to the left and your head to come back to the right. 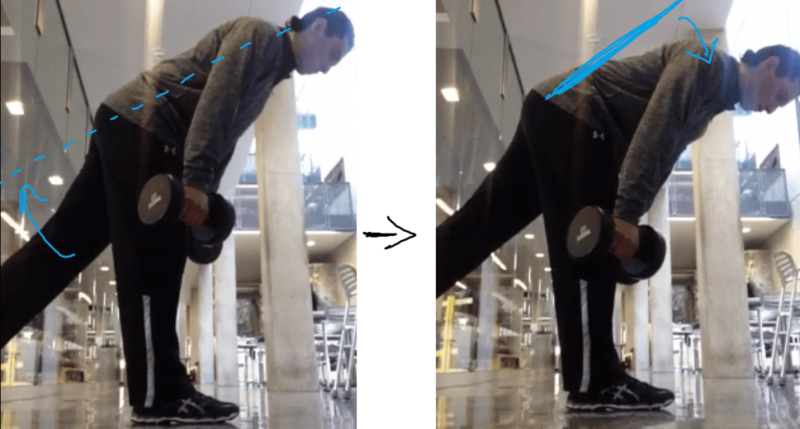 When you stand on your right leg (at least while doing a SLRDL with two dumbbells), your thorax does not come back to the left, so your head/neck has to. There’s a kink in the body’s linked sections. The picture above kind of shows what I’m talking about a little better, moving away from just the left should elevated and right shoulder depressed. See the lines I’ve drawn. Now look at the circles. These are spots of compensation: namely the low back and the neck. Notice the extra wrinkles in your shirt there. The big one for you, obviously, is the low back because of your symptoms there. Essentially, your low back is trying to pick up the slack for the stuff you can’t find from the bullets I listed earlier. This picture confirms that theory. This sequence of thinking is a good example of how multiple views/information is helpful, and not always necessary. It’s like running another experiment, tracking new data, and finding it supports your hypothesis. In the first picture, I would like your free leg to be back more. That is, I want that hip more extended. Driving this left gluteus maximus and hamstring in the sagittal plane allows the left low back in the sagittal plane to shut down. In other words, straighten your back leg to shut off your left back. The next main point is more important than bringing your free leg back. From these two pictures, you can see that your body stops moving as a unit in the last/middle half of your single leg romanian deadlift. It’s as if your hips to moving and your back does that whole lower portion of the lift. Like I alluded to, this is more evidence of the low back compensation I was describing earlier. Put most of your weight on your right leg. Hike your left foot up a little like you’re pulling your boot out of mud. Exhale your left ribs down. You should feel your left abdominal wall engage by this point. Hold onto this left abdominal wall feeling as you take a breath in, directing the air into your right armpit area. Exhale again, still hanging onto that left abdominal wall. Then begin moving. If you don’t already, you’ll soon feel a right gluteus medius like you wouldn’t believe. Maintain this set up throughout the exercise. Stay as long from head to heel as you can while doing this exercise. Without me grabbing more screenshots, your upper body looks similar when you’re on your left leg, except the pattern is more appropriate there. So give that a shot. If you cannot achieve this set up and all the feels I’ve mentioned (left ab wall, right glute), then we need to give you a different exercise. That’s it! Hope this was helpful to some of you out there. The single leg RDL is a very powerful exercise, but if you don’t do it properly, it’s just a boring waste of time. If you found this post helpful, I’d love it if you shared it with someone you know could get some help from it. Spreading the word helps keep this site running. If you’re unfamiliar with the exercise, make sure you get a coach to look you over so you’re not just ingraining poor technique. If you have any questions, let me know! I love talking shop. 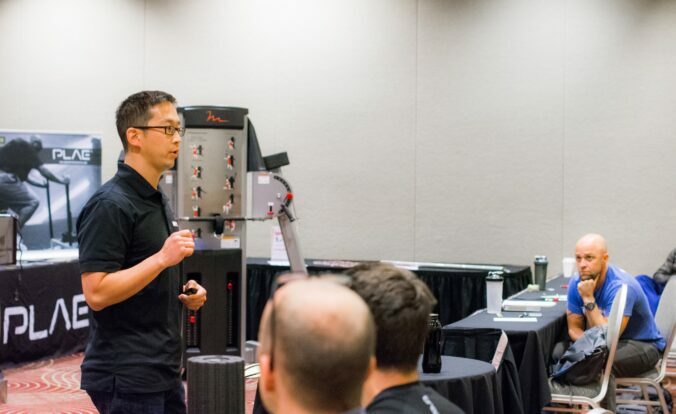 Specificity for Jiu Jitsu Fighters: Are you a fan of single leg jumps?